Closely tied in with the coverage, as with some kits, you’re getting 500 square feet of epoxy for a competitive price. Simply mix the two compounds together and apply evenly across the concrete surface. Quick drying for convenience. Extensive chemical and abrasion resistance means that this epoxy should remain shiny for a long time. Certain colors offer double the square-foot of coverage compared to competitor products, without doubling the price. In this review, we look at a reasonably priced, mid-range epoxy floor coating produced by the Rust-Oleum brand. It scores highly in all our main categories for Durability, Coverage, Value for Money and Ease of Application. The Rust-Oleum EpoxyShield Garage Floor Coating kit is a concrete surface paint coating that works in either home or commercial environments. Epoxy floor coatings are used specifically to coat concrete flooring, where aesthetics is of a primary concern. However, don’t let that fool you into thinking they’re easily damaged; some epoxy kits offer twice the durability of concrete itself. This product hasn’t been around for quite the same time as some competitor epoxy kits, having been introduced in around 2012, but it enjoys a solid reputation within the market. It’s extremely durable, yet affordable; just one unit should be enough to cover any 2.5-car garage within the home, though in reality you can probably stretch it further given the 500 square foot coverage. 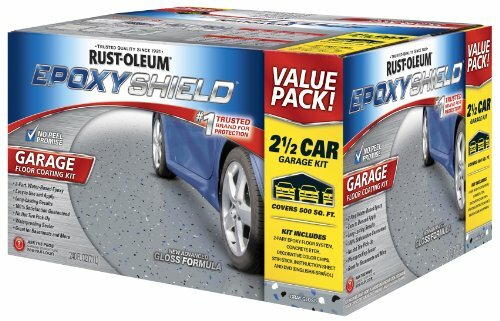 The Rust-Oleum EpoxyShield is suited for the homeowner looking to add a professional shine to their personal workspace, be it a concrete garage or basement workstation. The coverage afforded by a single kit will easily coat the flooring within a 2 to 2.5-car garage of average size, though if you’ve a small basement, you could realistically do your room with just one kit. Small business owners could also benefit from choosing the Rust-Oleum EpoxyShield kit, as the finish affords a high-quality, glossy shine to the flooring that would not be out of place in a showroom. That said, it’s worth bearing in mind that even 500 square feet of coverage might not be enough for even the smallest business premises. Still, you can always buy more. In such an environment, the tough durability of the finished product would be perfect for withstanding spills and frequent foot traffic. The only drawback to note here is that some customers have reported inconsistency between batches; this appears to be a frequent problem among epoxy products. If you’re planning on surfacing or resurfacing a large area, then there’s a small possibility that you could end up with a small color variation between the tins. Included within the kit are the essential 2-part water-based epoxy coating, as well as a concentrated cleaner. This cleaner will not only clean and degrease your surface in preparation for the painting but will also etch it. This is a process that increases the porosity of the concrete flooring, so that the epoxy has a greater rate of adhesion to the surface. You'll also get Rust-Oleum's decorative chips, used for adding a professional effect to your painted floor. As well as these chemicals, you'll receive a stirring stick for mixing your epoxy prior to application, as well as detailed step-by-step instructions and an instructional video for guidance. The Rust-Oleum brand boasts of the chemical protection properties of this floor coating kit, with resistance to gasoline, anti-freeze, motor oil, and salt. The painted surface will also resist damage from hot tires, as well as cracking and peeling that can ruin painted surfaces. After application, the floor is ready for foot traffic in as little as 24 hours, and for driving on within 72 hours. 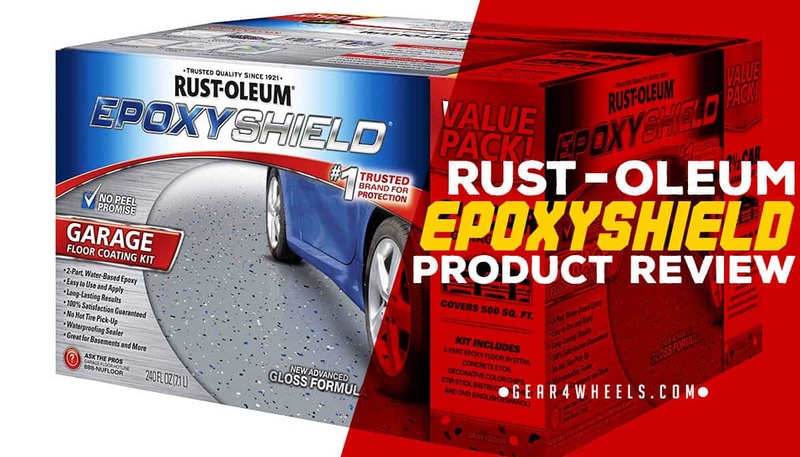 The Rust-Oleum EpoxyShield Garage Floor Coating kit is available in a couple of distinct colors, though if you want to enjoy the benefits of 500 square feet of coverage, you’ll need to opt for the straight gray or tan kits. This will provide enough coverage for the garage in the majority of modest-sized homes, though the other varieties provide half of this, at 250 square feet. In terms of value for money, they don’t get much better than Rust-Oleum products. The smaller, 250-square-foot kits cost less than many industry competitors, whereas the larger kits cost less than double the price, increasing the value. The product also scores highly on durability and ease of use. Overall, there’s little bad to say.